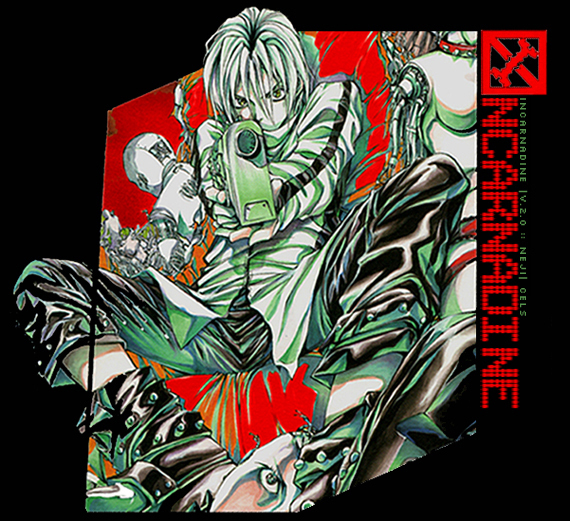 welcome to incarnadine, my personal collection of animation cels (currently under development). the gallery is named "incarnadine" for a reason; blood red is my favourite colour, one i find terribly appealing in its physical and symbolic senses. hence a name that is tailor-made for my small gallery (mostly of fey, witty, and/or smouldering animated males). to all fellow collectors, might i share the words of a wise woman [and collector] who once said: "the second you talk to someone else about this 'hobby' is the moment you realize you're insane." that says it all, ne? 3/4/2004 Over a year since I updated this site... and the private gallery is still not done. Sigh. I think I'm going to reopen this place up for a while and clean things up. We'll see where we go from there. 12/31/2002 GREN GREN GREN! what a way to begin 2003. 12/24/2002 a private christmas eve update just for tara-chan! 11/9/2002 so even though i haven't updated and closed the gallery, you peeps have been sneaking in! sneaky. tsk. my tamahome cel has been sold, so he's no longer around. i'll make a page for the dearly departed once i get my own gallery up and running. i wonder if anyone else out there has a saiyuki hanken genga? *cough* that's what y'all can expect in the next update. hopefully it won't be soggy with drool by then. so much updating to do... and no laptop to do it with. sigh.